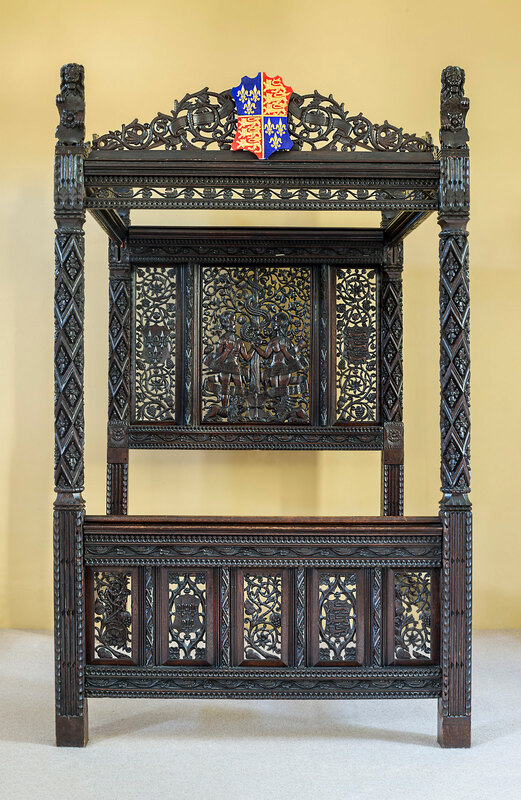 An age-blackened four-poster bed from the Tudor era that evidence strongly suggests is the first state bed of Henry VII and Elizabeth of York has been restored nine years after it was discovered in shambles. The Bed of Roses is the only surviving English medieval royal bed and the only known surviving piece of furniture from the Tudor-era Palace of Westminster. 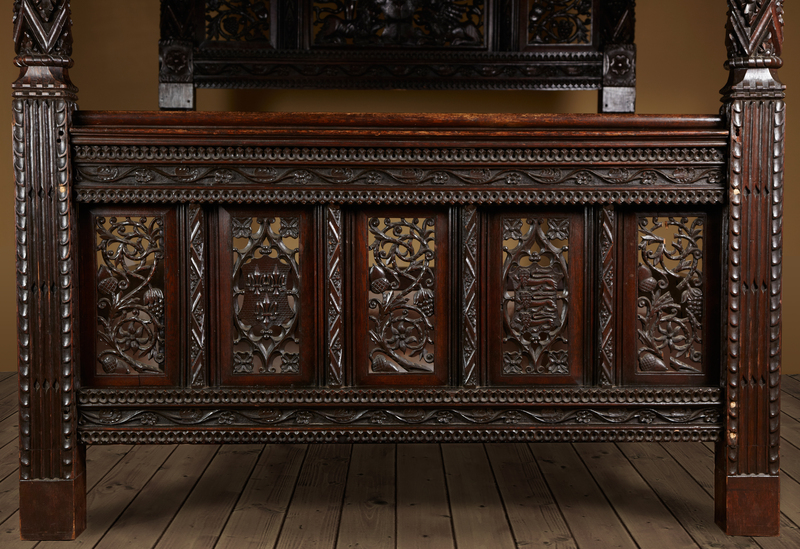 Tudor-era royal furnishings suffered wide-scale destruction during the English Civil War. It was made for the wedding of Henry VII (1485-1509) and Elizabeth of York (1485-1503) held at Westminster Abbey on January 18th, 1486. DNA testing of the wood identified it as European oak of a type that grows from southern France to Belarus. This oak was top of the line in the Middle Ages. Unlike the knotty oak native to England, this subspecies was regular enough that it could be sawed on power mills, producing beautiful even boards that were highly sought after by the crowned heads who could afford them. Edward III’s 1360 bed, for example, was made out of Latvian old-growth oak boards. The European oak was uniformly used across the whole bed, and the boards were treated with the same paint. If the frame were a composite made from salvaged elements, there would be inconsistencies that do not exist in this bed frame. Coal primer was found under the varnish and fragments of what was once a colorful paint job . The remains of that paint were tested and found to include ultramarine, the pigment made from lapis lazuli that was more expensive than gold in the Tudor era. The bed’s original residents did not have their initials carved onto the bed. No HR to make Henry’s ownership clear. However, the iconography does strongly point to him and his bride. There are single roses, representing the red of rose of Lancaster for Henry VII and the white rose of York for Elizabeth. Only they would use them and only for a few months. The double Tudor rose that would replace the single roses was created in April of 1486. 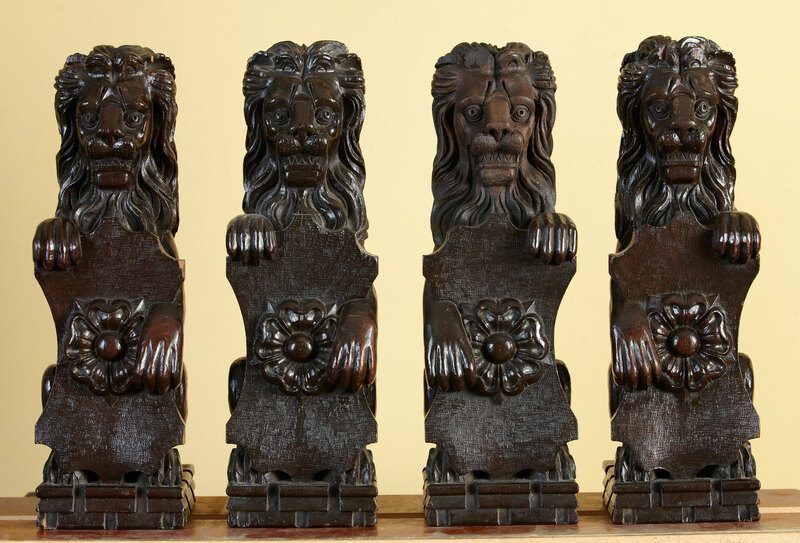 There are also four lion finials and coats of arms of England and France on the headboard and footboard. 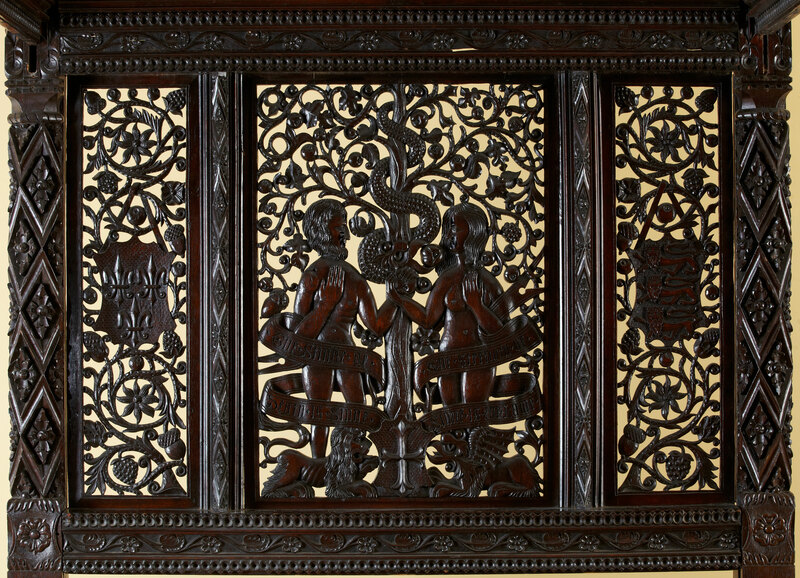 The headboard has a central panel showing Adam and Eve facing each other. Between them is a cockatrice (a beaked serpent) and under their feet are a dragon and a lion.Their faces resemble extant portraiture of Henry and Elizabeth, and even with demons and dangers between them and below them, still the serene figures triumph together. They are redemptive, symbols of salvation and the mystical union of God and Mary. The comparison of the King and Queen to saviors from evil were common in the Tudor era, especially so for Henry VII and the union of the warring houses. The ceremonial bedchamber of Westminster Palace where Henry and Elizabeth would have gotten to work producing an heir to the throne was known as the Painted Chamber after the murals depicting religious royalty themes. In 1819, the mural on the north wall — the coronation of Edward the Confessor — was rediscovered. It burned 25 years later, but records of it indicate the shape of the bed and posts match the arcade at the center of the mural exactly. Symbols of fertility are appropriately present for a state bed. There’s an acorn, a bunch of grapes and a strawberry. The royal coat of arms, the cross of Edward the Confessor, the roses, the Biblical references, the top-quality craftsmanship, expensive imported wood and insanely expensive ultramarine pigment all strongly indicate that this is the royal letto matrimoniale, but the one fact that would come closest to fully confirming its identity as the marriage bed of Henry and Elizabeth has thus far been impossible to ascertain. All attempts to radiocarbon date the wood have failed due to the layers of varnish. Dendrochronology results have been all over the place. Still, the odds of such an exceptional piece laden with the qualities and symbolism of the royal union that put paid to the Wars of the Roses being any other bed are slim to none. Owned by the Langley Collection, the Bed of Roses is often loaned or exhibited in museums. Most recently it was displayed at the Victoria & Albert Museum where it was the subject of a symposium on research into the bed’s history. Ian Coulson had made a documentary about the research into the bed and the restoration process. It’s fantastic. I only wish it were longer.